When you feel your best, it really shows. 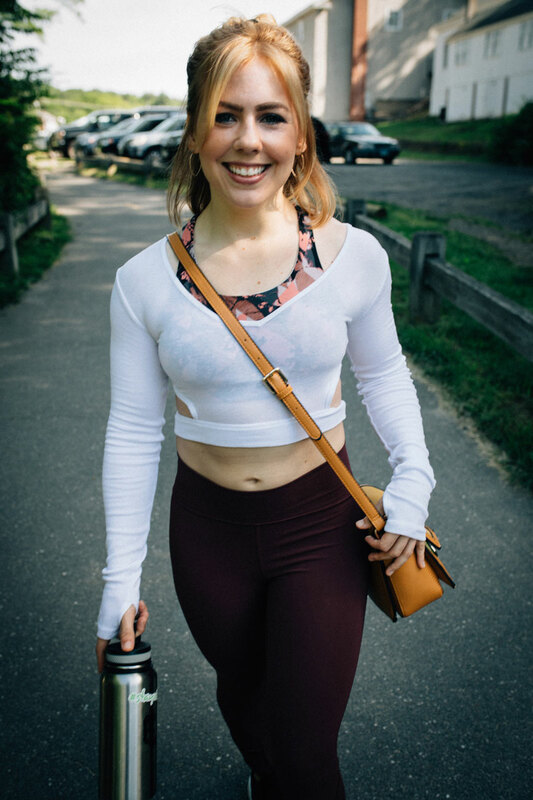 We’re going in-depth with Ashley Liberi, Vibrant Health ambassador, customer service specialist, and so much more, to chat about her day-to-day—so we can learn what she does to keep looking and feeling amazing! 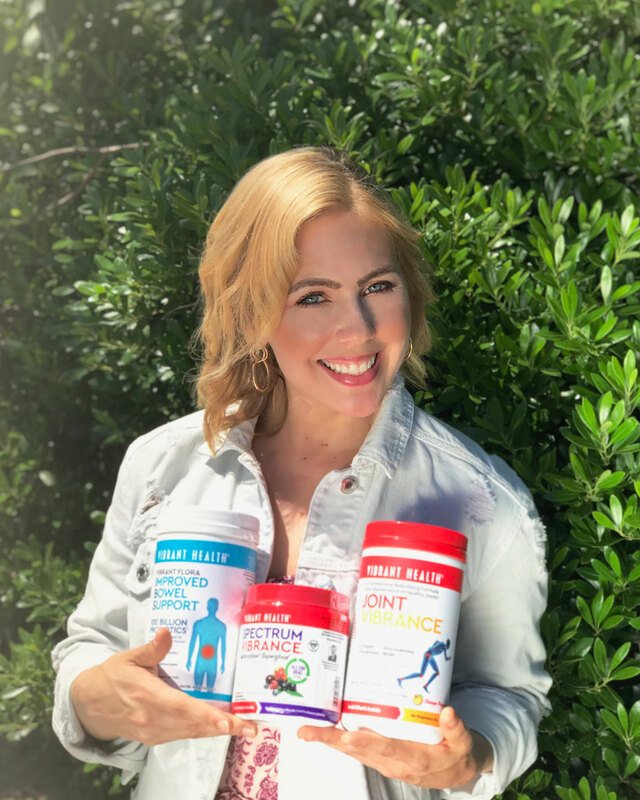 Vibrant Health: Hey, Ashley! We know you love working at Vibrant Health. But what do you do outside the office? We really can’t picture you as a cubicle dweller. Ashley Liberi: Oh my gosh! I can’t sit still for the life of me! I’m constantly doing something, whether that’s going to the gym after work (or before work sometimes, if I’m not too tired! ), taking a walk or driving somewhere, teaching boot camp classes on the weekends, sitting outside on my patio or at the pool, shopping or cleaning my condo—I’m always doing something! VH: Wow, you teach boot camp classes? That’s awesome! What’s your own fitness routine look like? AL: For the past 5 years, I’ve been obsessed with high intensity interval training workouts (aka HIIT). These typically involve brief, all-out work periods, separated by rest periods that you wish were longer! My sister and I both do the same circuit timing: 45 seconds of work; 15 seconds of rest. We always do at least 5 circuits, with two exercises per circuit and then complete 6-8 rounds of each circuit. We then rest 1 minute after we complete a circuit, before we move on to the next. I’m telling you, it’s no joke! Also, you really don’t need to do a full 60 minutes with these types of workouts. You burn more calories in a shorter period. Ashley with her Beauty Bundle recommendations! VH: Do you have a supplement routine? AL: I do! I have Vibrant Health’s Joint Vibrance and Vibrant Flora Improved Bowel support twice a day. I find, with my strenuous workouts, that this routine works best for my body. VH: Why did you pick those supplements? 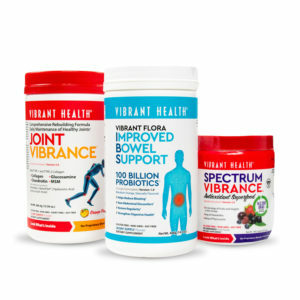 AL: For starters, Joint Vibrance is essentially food for my joints. It contains everything I need for the growth and repair of my joints and muscles. You’ll find Type 1 and 2 of the best quality collagen, which acts as a cartilage builder and anti-ager. How cool is that? Aside from being a serious cartilage builder, collagen can increase skin elasticity and provide a pretty good deal of hydration for your skin! In addition to collagen, there’s also my favorite anti-inflammatory ingredient in Joint Vibrance, which is turmeric. There’s a really strong dose of it too! And it’s also an antioxidant. For mobility, flexibility and hydration of my joints, I’m obsessed with hyaluronic acid. Joint Vibrance contains 120mg of hyaluronic acid! It keeps my skin looking nice and vibrant as well! As for Vibrant Flora Improved Bowel Support, all the ingredients in this supplement work like magic for keeping my belly feeling and looking flat and lean! Yes, I said lean! Aside from the 100 billion probiotics in every scoop, there’s anti-inflammatories to help my belly feel nice and calm, even after a weekend of eating not so healthy foods. In addition, there’s 700mg of both L-glutamine and L-arginine, which are both amino acids that are building blocks of protein and needed by your body in copious amounts. Both amino acids are highly important in treating any sort of intestinal issue. They’re both also amazing to assist with weight-loss, fat-burning and building lean muscle! VH: Let’s get some real facts – has it been working for you? AL: It absolutely has! Since I started this regimen about 2 months ago, I’ve lost one pant size! For years I’ve been a size 26 (which is size 2) and with the help of Vibrant Flora Improved Bowel Support, I am now a size 25 (size 1!). I also have never felt so lean. I have more definition in my mid-section, as well as the top of my shoulders and biceps. According to studies,you need 2 to 5 grams each of L-Glutamine and L-Arginine to see and feel results. One serving of Vibrant Flora Improved Bowel Support contains 0.7 grams each of both amino acids, and since I take Vibrant Flora Improved Bowel Support twice a day, I’m getting just about the right amount! VH: That’s awesome! If someone wants to start a beauty supplement routine, what would you recommend? AL: I highly recommend Joint Vibrance because of the facts I stated above, involving the benefits of its ingredients. Collagen, hyaluronic acid and Vitamin C are three of many anti-aging ingredients recommended by most estheticians, homeopaths and even dermatologists. Vibrant Flora Improved Bowel Support is a must — who doesn’t need an awesome array of probiotics that keep their digestion in check? As a bonus, there’s nothing like Spectrum Vibrance for antioxidants to fight free radicals. That’s where I’d suggest starting. VH: Thanks, Ashley! Stay vibrant!